Vodafone and Virgin Media have topped Ofcom's latest league tables of most-complained about telecoms and pay TV providers. The latest quarterly figures published by the regulator confirm Virgin Media was the most complained about pay TV service. The figures cover July-September 2018, coinciding with the period when UKTV's channels were not available on the platform following a dispute between the two companies. Ofcom says the main reasons for complaints related to contracts and complaints handling. BT TV was the second most complained about pay TV service. 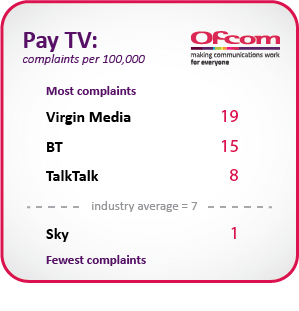 Virgin Media also attracted the most complaints surrounding its mobile service, while Vodafone's relatively new landline and home broadband service resulted in the most complaints of any provider to Ofcom. Post Office is now also included in the Ofcom complaints figures for broadband for the first time, and has performed better than the industry average. Sky, Tesco Mobile, EE and O2 continue to perform better than the industry averages for the services they offer. With so much competition in telecoms and TV services, companies that are falling short need to make quality of service and complaints handling their priority. Customers who aren’t happy with their provider can shop around and vote with their feet. Although Ofcom isn't able to resolve individual complaints, it offer consumers advice, and the information it receives can lead to them launching investigations.